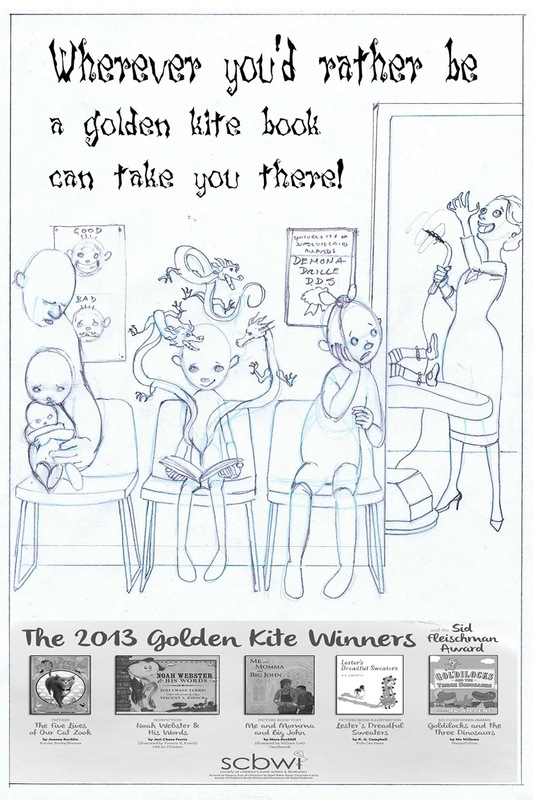 The 2014 Golden Kite Poster by K.G. Campbell - The behind the scene interview ...And your chance to WIN a copy! Lee: Hi Keith! A pirate bed coursing through the waters, a golden-kite-sailed ship in the distance, the tagline... Can you share your process of coming up with the concept and design for this year's poster? Learning from my mistake, I realized I’d have to choose my setting carefully. Where are kids typically reading (school) that it’s OK to suggest they’d like to escape from (yikes, not school). And thus we arrive at bed-time. The bed-as-boat thing is hardly original. Off the top of my head I can’t think of a literary precedent, but what kid’s bed (my own included) hasn’t been appropriated as a galleon or a spaceship or a fort? Of those options, a breezy, ocean-going scene seemed best suited to a summer conference. From there I went to Howard Pyle and N.C. Wyeth, and from there it was pretty obvious how this year’s golden kite (there’s always at least one in the poster) should be incorporated. Tada! Lee: Fascinating - I love hearing that evolution. With well-published and award-winning illustrators like yourself, there can be a perception that you're past the making mistakes, experimenting and challenges of creating new work - that it's all somehow magically easy once you've 'made it.' Tell us what happened in the process of creating this poster. Keith: I’m not sure that four books qualify me as well-published, but thank you for making me sound so grand. I suspect a little bird (named Sarah) at SCBWI has shared with you the fact that I had some “technical difficulties” with this poster. Keith: I am not a young person, but I am actually a fledgling illustrator. I’ve only been at this professionally for a few years. Moreover I’m self-taught, so didn’t benefit from those art school years that provide instruction and permit experiment in various media and techniques. In short, I’m still playing around and making mistakes (or discoveries if you’re of a more optimistic bent). Unsure of how the visual texture might be affected by a significant enlargement, I chose to render this piece at close to scale (24” x 36”). With watercolor and colored pencil, it was quite a time-consuming undertaking. I was working with Rives BFK printmaking paper which I’d used for The Mermaid and the Shoe. It’s not a hardy, forgiving surface but colored pencil blends and smudges on it exquisitely. As you can imagine at these dimensions, the background was a bit of a bear and took me a couple of days. Unfortunately, when I came to remove the masking fluid that was protecting the figures it took the soft, velvety surface of the Rives BFK with it! It cost me my deadline (although the folks at SCBWI were more than generous with their sympathy and flexibility) and sent me on a wild scramble to find an alternative surface (it’s watercolor board if you’re interested). Lee: Is there a lesson there for other illustrators to note? Keith: If you can, go to art school. Otherwise, if you make even a slight change to your process (in Mermaid I’d used grey paper, for the poster I used white; I guess it was softer), test it first. Seems pretty obvious now. Lee: Thanks for sharing that! How have things changed for you since winning last year's picture book illustration Golden Kite for your "Lester's Dreadful Sweaters"? Keith: One very welcome change is that my agent is no longer forced to knock on doors hunting down my next project. I am in fact now forced to pass on much of what is being offered to me. I’m such a hopeless Yes Guy it makes me feel terribly ungrateful. But in the end there is only so much time in the day. If I take on too many illustration projects it prevents me from writing my own manuscripts. Secondly - referring back to a previous question - my lack of formal art training has left me with a certain sense of inadequacy. I’m constantly dogged by the suspicion that there is this vast wealth of practical knowledge of which I’m completely ignorant. As a result I’m always concerned that my work might appear amateurish or unprofessional. Winning the Golden Kite was quite the boost to my self-confidence. Every time I look at my shiny award I feel less like an imposter, and more like a real live illustrator. Lee: You ARE a real live illustrator! You are! Can you share your favorite piece of advice for other illustrators and author/illustrators? Keith: It’s not about how you say it; it’s about what you say. Yes, a painstakingly rendered painting or a stylishly-turned phrase can make your book a very lovely thing. But if the story does not engage the reader, if it doesn’t move them, if the story is without substance, then it is a lovely thing without a heart. Speech bubbles and doodles can have as much depth and humanity as poetry and oil paint. No need to hide your talents. Deliver your virtuoso performance by all means. But never let style subvert substance. The story always comes first. Always. 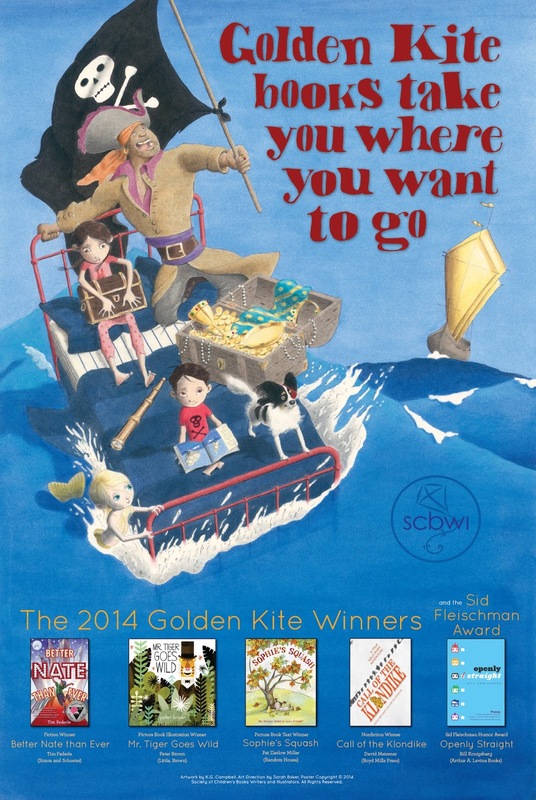 Would you like your very own copy of the amazing 2014 SCBWI Golden Kite Poster? Enter a comment here in the next seven days and we'll randomly choose one lucky person to win! 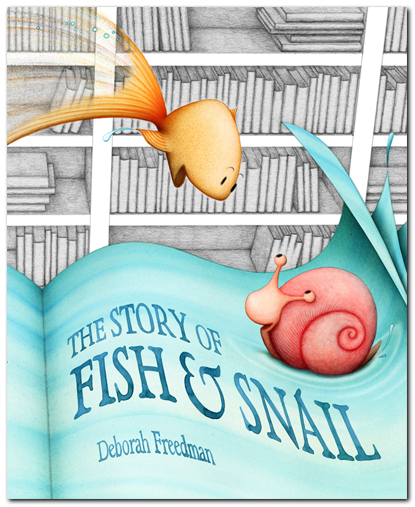 And if you work at a bookstore or library and would like a copy to display, please send an email to: sarahbaker (at) scbwi (dot) org. To find out more about K.G. Campbell and his work, visit his website here. Pat Zietlow Miller on "Sophie's Squash" - The 2014 Golden Kite Interview ...And your chance to WIN a copy! This year's Golden Kite Award for Picture Book text goes to Pat Zietlow Miller, for "Sophie's Squash!" 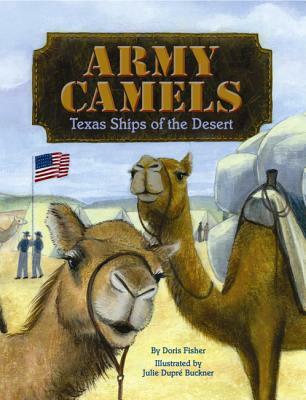 Pat Zeitlow Miller, winner of the 2014 Golden Kite Award for Picture Book Text! Lee: Can you tell us about finding out you'd won the 2014 Golden Kite Award for picture book text for "Sophie's Squash"? Pat: I was at home. The phone rang, and my caller ID said “Lin Oliver.” I had never met Lin, but I knew who she was, of course. But I couldn’t imagine why she’d be calling me. I thought maybe it would be an automated message from the SCBWI talking about dues or some administrative change. When I answered, and found out it really was Lin on the other end, I was a bit stumped. I knew about the Golden Kites, but I didn’t know what the timing was for them or how they were selected. Once Lin told me “Sophie’s Squash” had won, I was thrilled and shocked and giddy all at the same time. And, frankly, a little astounded. 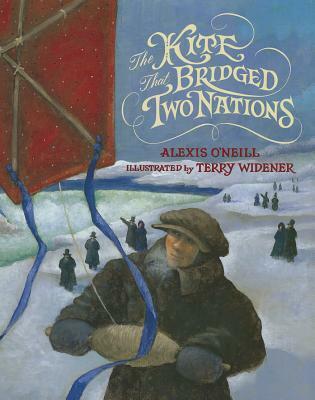 There were so many wonderful picture books published in 2013. 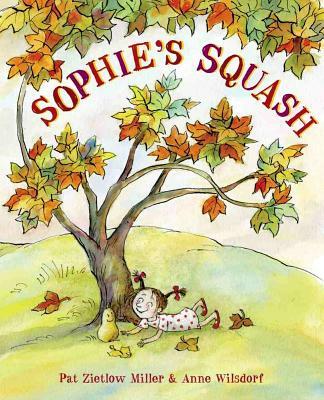 Lee: The book's flap copy says that "Sophie's Squash" is based on a true story - your daughter, Sonia, once loved a squash? Pat: Yes! When Sonia was 3 – she’s now 12 – she fell in love with a butternut squash we bought at the grocery store. She gave it a face, wrapped it in a blanket and carried it everywhere. She did the same with other items – like rocks and those small bags of flour. 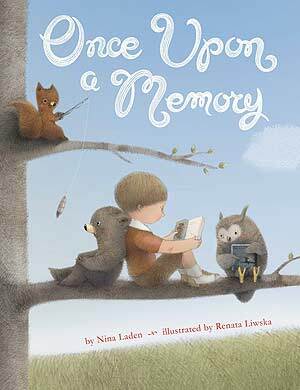 Lee: So what was the process of taking a real-life inspiration and make it a picture book? Pat: Sonia’s love for her squash gave me the initial idea for the book. But by itself it wasn’t enough. If I had written the book exactly the way things happened in real life, it would have been an amusing anecdote, at best. And that’s kind of what my first draft was. It took me a while to build out a full story and figure out the problem (the rotting squash, a long winter apart) and the resolution (baby squash). Another Sonia memory helped me pull things together. When one of our cats died, we had it cremated. Then, we planted a tree, sprinkled the ashes and shared memories. (Of course, we also read Judith Viorst’s “The Tenth Good Thing About Barney.”) Once we were done, Sonia asked with utter sincerity, “Now, will a new kitty grow?” That memory gave me the nudge I needed to move the story in the right direction. I also feel compelled to admit that I was not as patient as the parents in my book. I smuggled Sonia’s squash out of her room before it started to rot and bought her a replacement. She didn’t seem to mind, but one of the benefits of writing fiction is you can make things turn out the way you wish they had in real life. "Every night, Sophie gave Bernice a bottle, a hug, and a kiss." "Well, we did hope she'd love vegetables," Sophie's mother told her father. "Shhhhhhh," Sophie said. "Bernice is sleeping." How do you approach writing "funny?" But that’s probably not helpful. The humor in this book is very close to my own, with some splashes of Sonia. She’s had a very dry sense of humor ever since she was little, and I’ve always enjoyed the juxtaposition of the maturity of her humor with her cute, small-child face. I didn’t set out to make the book funny, but there were just too many places to work in humor to pass them by. When those opportunities are there, it is terribly wrong to ignore them. Pat: This is something I worked very hard on. And I’d say it’s the common denominator in all the picture books I have coming out in the next few years. With the challenges of growing up, it’s important for children to see warmth, safety and family love in books. I don’t want to beat readers over the head with those things or – heaven forbid – work in a moral, but I want those feelings to be the underlying core of every story I write. Not every child has warmth, safety and family love, but they should know those things are possible and that they deserve them. I also like having parents in my books. 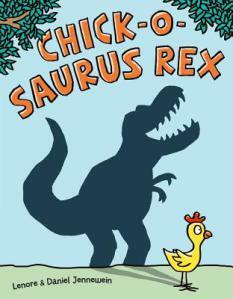 A lot of children’s literature disposes of parents neatly early on. They’re dead or traveling or self-involved or dysfunctional. And, there are good reasons for telling stories that way. As a major Harry Potter fan girl, I understand those reasons. But I like having parents in my stories who might not be perfect, but who support their children’s efforts and love them, while still giving them room to figure things out themselves. They’re kind of a safety net while their children are teetering on the story’s high wire. Lee: I love that - parents as "a safety net while their children are teetering on the story's high wire." Nicely said! 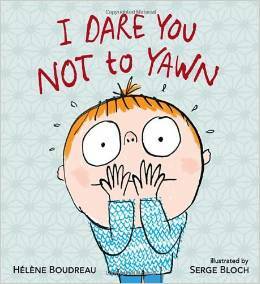 Writers just starting out often look at picture books and their small word count and think, "Oh, that must be easy to do, it's so short." Those of us who have been at this a while understand just how challenging the short form can be! "Sophie's Squash" is your debut picture book - how many drafts did you write before arriving at the words that were published? Pat: Oh, goodness. At least 10 full drafts with a variety of different approaches and endings. The good news is that when I finally sold the story, I didn’t have to do too many revisions for my editor. Pat: I joined SCBWI about six years ago, and it’s been vital to my success. I attend state meetings in Wisconsin, where I live, and also in Iowa, which is relatively close to where I live. 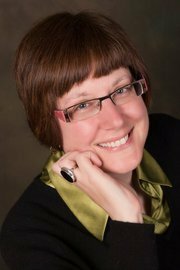 At SCBWI, I’ve made friends, found critique groups, learned from visiting authors and editors, and found my agent – the inimitable Ammi-Joan Paquette – after she spoke at an Iowa event. When I started, I knew nothing. SCBWI helped me figure out how to do what I wanted so desperately to do. And once I did it, the people there have been nothing but supportive of me and my book. 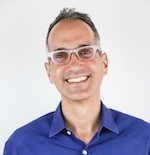 Lee: In addition to attending #LA14SCBWI - The 2014 SCBWI Summer Conference - to accept your Golden Kite Award, you'll also be on faculty, giving the Friday breakout session "When Less Is More - Cutting the Fluff Out Of Picture Books." Can you tell us more about that workshop? Pat: For picture books to work, they need to be lean, using no more words than are truly needed to tell the story. What I see in a lot of beginning manuscripts – or manuscripts from folks who usually write for older audiences – is way more words than the story requires. And often, the writer could cut 200 or more words from his or her manuscript without sacrificing plot in the slightest. Some people are aghast when they hear this, but it’s true. I’ll be sharing techniques writers can apply to their picture books in progress to get rid of words that don’t add value to their story. 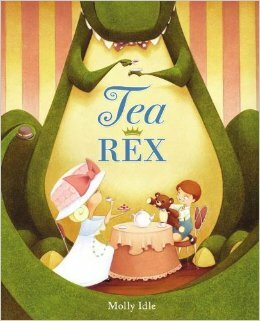 What advice do you have for other writers working on picture book manuscripts? Pat: Everyone says this, but it’s so true. READ. When I started seriously pursuing a career in children’s literature, I made a list of my favorite picture book authors – Cari Best, Dori Chaconas, Kelly DiPucchio, Jill Esbaum, Mem Fox, Kevin Henkes, Mary Lyn Ray, Liz Garton Scanlon and Judith Viorst to start – and I checked out every book they’d ever written from the library. I spent weekends really reading them and figuring out what made their books work for me. How did they handle page turns and tension? What did their words show and what did they leave to the illustrator? How did their endings tie everything up? It was basically my own master class in picture book writing, and it was one of the most enjoyable classes I’ve ever taken. 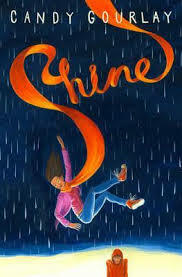 If you'd like to hear, learn from, and cheer Pat on as she accepts her Golden Kite Award, join us at the 2014 SCBWI Summer Conference, August 1-4 in Los Angeles. Registration and information here. Would you like to win a free copy of "Sophie's Squash?" "Texas has seen the future of the public library, and it looks a lot like an Apple Store." 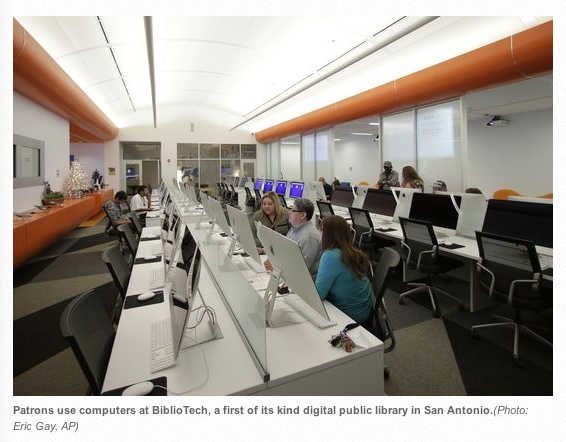 Paul J. Weber, The Associated Press, reported earlier this year in USA Today about Bexar County' BiblioTech, "the Nation's only bookless public library." San Antonio is the nation's seventh-largest city but ranks 60th in literacy, according to census figures. Back in the early 2000s, community leaders in Bibliotech's neighborhood of low-income apartments and thrift stores railed about not even having a nearby bookstore, said Laura Cole, BiblioTech's project coordinator. A decade later, Cole said, most families in the area still don't have Wi-Fi. "How do you advance literacy with so few resources available?" she said. Residents are taking advantage now. The library is on pace to surpass 100,000 visitors in its first year. Finding an open iMac among the four dozen at BiblioTech is often difficult after the nearby high school lets out, and about half of the facility's e-readers are checked out at any given time, each loaded with up to five books. One of BiblioTech's regulars is a man teaching himself Mandarin. One interesting angle is that "The space is also more economical than traditional libraries despite the technology: BiblioTech purchases its 10,000-title digital collection for the same price as physical copies, but the county saved millions on architecture because the building's design didn't need to accommodate printed books." -- Namely, books are heavy, and buildings designed to hold thousands of them need to be able to bear that weight. Other public library efforts to go bookless haven't succeeded in the past. Will this one? And is this all-or-nothing approach to going digital a glimpse of the future, or a experiment that's gone too far? Unexpected Statistics - give away your book and sell... MORE. "Sales is not one of our key metrics, but it's still great to see. 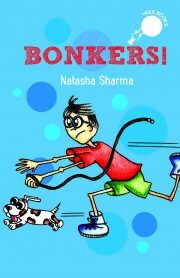 It shows us that the WBN editions are going to non-book-buyers and with no negative impact on sales; only positive." The marketing implications are fascinating! Karen Avivi's YA novel SHREDDED was one of two winners of the inaugural SCBWI SPARK Award, the new annual award that recognizes excellence in a children’s book published through a non-traditional publishing route. 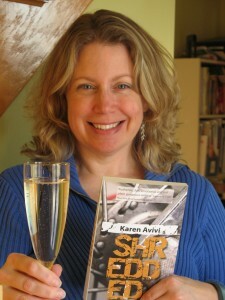 Karen Avivi celebrating her SCBWI SPARK Award! 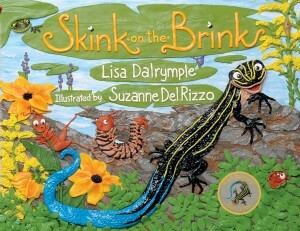 Lee: Congratulations on winning the inaugural SCBWI SPARK Award! Karen: Thank you! It was quite a surprise to receive that phone call, and an honor for Shredded to win the Spark award. Lee: The Judges called your girls' freestyle bmx bike YA novel "heart pounding!" - please tell us what the story is about. Karen: Shredded is a contemporary young adult novel about rule-breaking, gravity-defying girls who shred riding freestyle BMX. The main character, Josie Peters, thinks she’ll do anything to ride in the Ultimate BMX freestyle event the summer before her senior year. To hit the qualifying events in the Midwest, Josie and her friends take off on a summer road trip where late-night parties, an intimidating mega ramp, and the lure of sponsorships spark friction between the girls. When Josie’s best chance for success depends on her relationship with flashy rider R.T. Torres, she has to decide what she’s trying to win and how much she’ll sacrifice. More than a girls’ sports book or a BMX biking book, Shredded is a motivating push-your-limits story that takes on feminism, friendship, sexism, and sibling rivalry. Lee: Are you, in some way, your main character Josie? Karen: I enjoy individual fringe sports; I’ve tried skydiving, scuba diving, stunt classes, archery, winter camping, orienteering, mountaineering, mountain biking and backpacking but I’m not as confident or athletic as Josie. She’s the kind of person I’d admire and want as a friend. Lee: The SPARK award is to recognize excellence in a children's book published through a non-traditional publishing route. You self-published Shredded via CreateSpace. Can you explain how you made that decision? Karen: I wanted to make a print version of Shredded available to as many people as possible without investing in an inventory of print books. The print-on-demand service offered by CreateSpace was the best, most cost-effective option. CreateSpace allows you to upload your own print-ready files without forcing you to pay for an overpriced editing and cover design package. Lee: As the writer and publisher of Shredded you're wearing two hats already. We know with traditional publishing there are lots more experts involved, including an editor, a copy editor, a book designer, etc... How did the process of getting Shredded ready to be published evolve? Karen: There are many professional editors and cover designers who do freelance work. The trick is to do your research and book them in advance because the good ones are busy. My editor, Anne Victory, managed to squeeze me in when someone else missed a deadline. 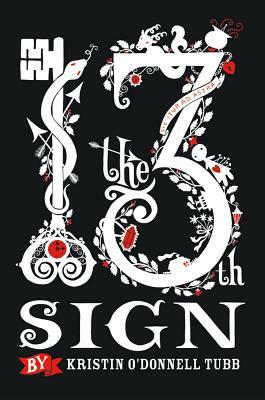 Lee: What do you see as the biggest challenge of self-publishing? Karen: Discoverability. 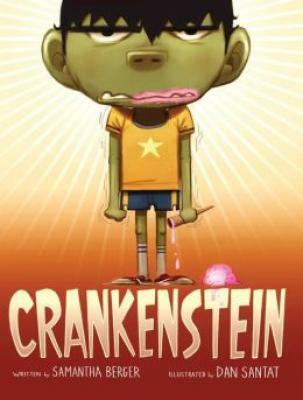 It’s up to me to reach reviewers, bloggers, librarians, teachers, and readers. I’m building my list of contacts one by one. Lee: That's interesting, because I would imagine many traditionally published writers would also say that their biggest challenge is 'discoverability!' Keeping with that question theme, what have you discovered is the biggest advantage of self-publishing? Karen: I can change anything whenever I need to. Since there is no inventory of printed books, I can change the cover, add review blurbs, and make revisions at any time. Lee: Fascinating. I remember a very well-published author answering the revision question 'how do you know when it's done' by saying 'when they rip it out of my hands and publish it.' Being able to change things even after it's "published" sounds like it could be both a blessing and a curse! Anything else you'd like to share about the adventure so far? 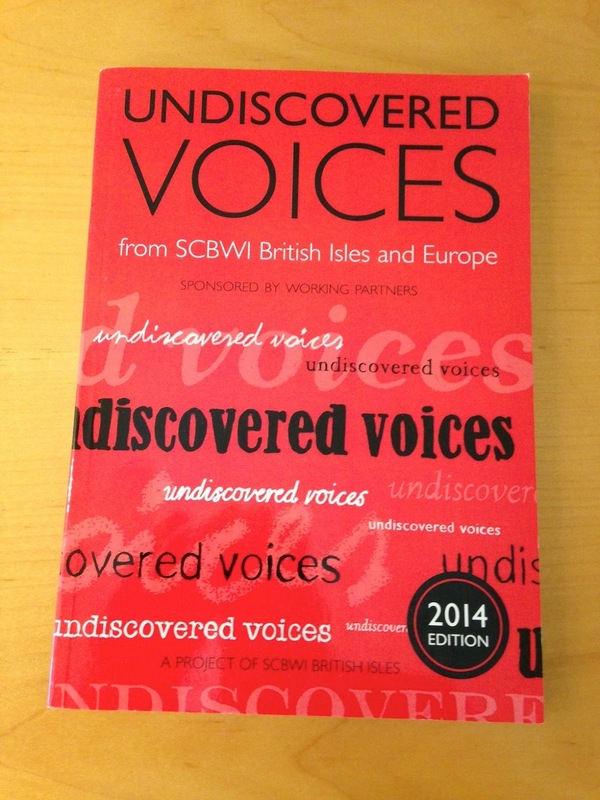 Karen: I told myself I’d treat my first self-published book as a learning and information gathering experience. I’d advise anyone else going the indie pub route to do the same. I feel much better prepared to launch my next book, hopefully this fall. Also, Shredded just won a 2014 Independent Publisher Book Award: tied for Bronze in the juvenile / young adult fiction e-book category. Lee: Thanks so much, Karen! And once again, congratulations! 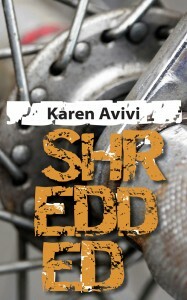 To find out more about Karen and her book Shredded, check out her website here. 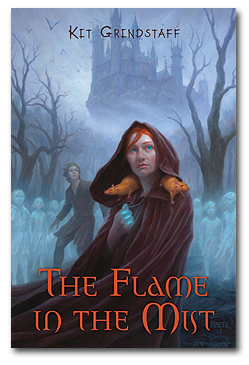 And to find out more about the SCBWI SPARK Award, visit here. "The eye and the ear are different listeners." Jane Yolen is a legend, the author of over 300 books for children and teens, a member of SCBWI's Board of Advisors, and a brilliant teacher! If you believe your good reviews, you will have to believe your bad reviews, too. Better to believe in the piece that you are writing. Thanks to Jane for the insights and to Julie for sharing! 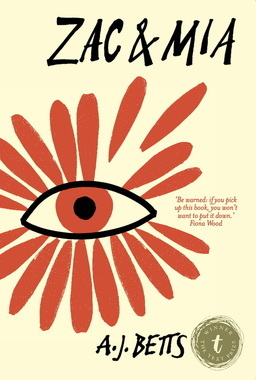 Catherine Linka's Brilliant Marketing Innovation For Her Debut YA Novel, "A Girl Called Fearless"
Catherine Linka is a veteran children's book buyer and a debut YA novelist. Thanks Catherine, for sharing that idea with us. 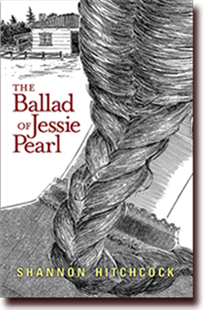 And congratulations on the publication of "A Girl Called Fearless!" The Crystal Kite Member Choice Awards are given to recognize great books from the seventy SCBWI chapters around the world. Those seventy chapters are divided into fifteen regions, each of which votes for their own Crystal Kite finalists and winner. To find out more about the Crystal Kite Awards, and how you can enter your book for the 2015 awards, check out all the information here.